One never knows what kind of material will be next, when cataloging for library branches serving Smithsonian’s 19 museums and research centers. I recently received a box of DVDs that needed complex copy and original cataloging. The first several DVDs were oral history interviews with Navajo Code Talkers, which immediately piqued my interest. As I worked my way to the bottom of the box, I found that the interview topics were more diverse. The DVDs in question resulted from an oral history/documentary studies project (Navajo Oral History) at Diné College and Winona State University. Students conducted interviews with Navajo elders who worked in a wide variety of fields and shared many life experiences. The project focused on teaching the basics of journalism, photojournalism and ethnographic research. The students worked in groups and learned how to conduct personal research, interview, create video documentaries, and supplemental works like transcriptions. The interviews often manage to encapsulate what makes oral history projects captivating. At their best, they enable the interviewee to not only share their knowledge but also tell their own story. Interviewees describe moments in life that might not be judged as major events, but the events’ effects resonate throughout their lives in important ways. 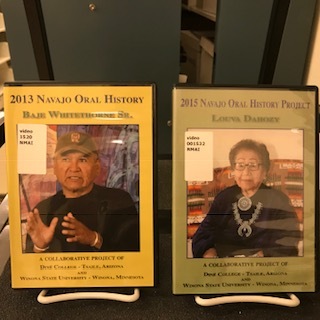 DVDs from the Navajo Oral History Project, in the Vine Deloria, Jr. Library, National Museum of the American Indian. Materials in Smithsonian Libraries come from a wide variety of sources. This has increased in recent years, as subject matter experts find ways to produce their own work, e.g. publishing through companies like Amazon, or producing A/V materials on DVDs in-house. Subject matter experts produce quality content, but sometimes provide information on a book cover or container in ways that differ from traditional sources like large publishing houses. This can complicate describing materials in library catalog records. Small details on a book cover or DVD container can be misunderstood and affect discoverability, especially when materials are part of a larger collection or series. This was the case with the Navajo Oral History project. Each year the project would produce a new group of DVDs that included the year and project name. This choice in packaging had an unexpected effect on the way the materials were described in catalog records. The year and the name of the project are prominent on the DVD container. Catalogers understood this to mean that each year was a separate project. Videos were cataloged like a book series from one year, and had a series statement, e.g. “2009 Navajo Oral History Project.” This meant a user could easily find all the DVDs from a specific year in the library catalog, but they might miss discovering five more years of recordings. By reaching out to the faculty advisors directly, we learned that it was indeed a multi-year project that ran from 2009-2015. Each video now includes the name of the project “Navajo Oral History (project)” so that all the DVD’s appear in one search. Instead of finding 5 to 6 DVDs from one, a researcher can find the more than 30 interviews in one search. Videos were deposited with Smithsonian Libraries and are also available online via Vimeo.com. For additional information about Navajo Oral History, see this article in the Tribal College Journal. Thanks for this article. I came across it Dec. 21, 2018. I’m glad the Navajo Oral History Project is getting more positive recognition. The students involved worked hard, and learned much, while completing the films. 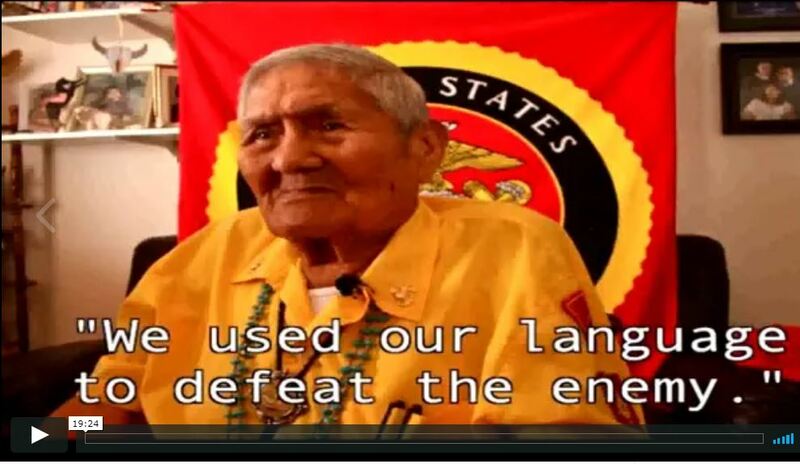 In the six active years of the project, just over 100 students participated and created 27 films about 27 Navajo elders, including nine Code Talkers during World War II.